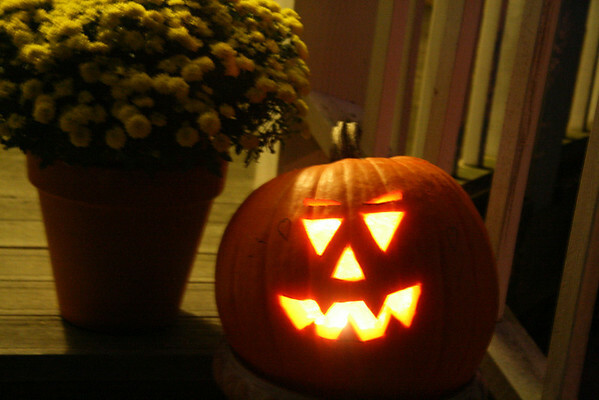 Is there anything sadder than a jack-o-lantern the morning after Halloween? Well, of course, yes, I'm sure there actually are sadder things, but work with me here, m'kay? It's only the day after Halloween, but everything BOO-related already seems terribly dated and tired. Time to move on to the pilgrims and the turkeys I suppose. 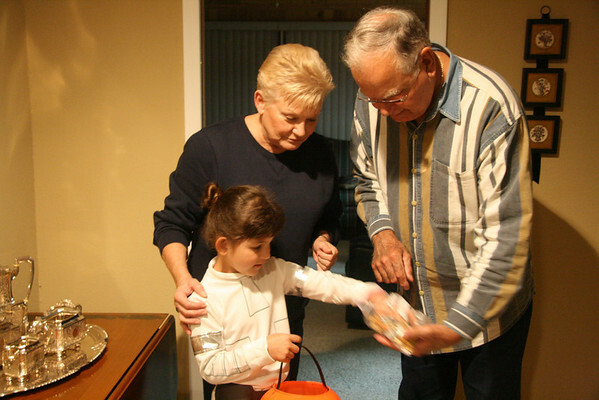 We walked a few houses down to go trick or treating at Pappo and Grandma's house. They scurried to find some candy and came up with some Hershey Treasures they had squirrelled away. Annelise, I mean Padme Amidala, didn't seem to mind. We then ventured out to a local Halloween carnival at one of our city parks. I wish we had gone earlier in the evening because a slightly older crowd was in full force. It's true, the freaks come out at night, even at 8:00 pm. Think scarily dressed teens, scantily clad nurse uniforms, Goth skeleton baby daddy pushing his offspring in a stroller, and a freaky troll man carrying a Chucky doll. Thankfully, she was oblivious to all of that since there were several games to play and a bouncy castle thing to jump in. We all agreed to skip the haunted house. We finished up the evening with a trip to Dairy Queen for some frozen goodness and then our traditional family viewing of the classic It's the Great Pumpkin Charlie Brown. Hope y'all had a boo-rific Halloween and got more than a rock in your treat bags! Max called that movie a "classic" when he talked about it the other day. Cracked me up. We love the Charlie Brown holiday movies. 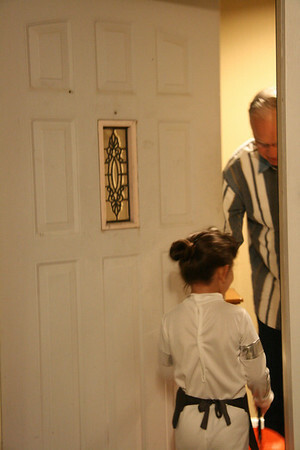 Our trick n' treats were OK, but seriously - I am glad it's over. Just sayin'. jack looked at me at 10 o'clock this morning and said, "we need to get this halloween stuff put away." I love Annelise's costume! A trip to Dairy Queen and THe great pumpking is definately a fun end to Halloween! We've had our Halloween decor up for over a month now (which is a record for us) and I really need to take it all down today, it's just that my November decor is somewhat lacking. The thought of the grandparents scurrying to scrounge up some Hershey's treasures is hilarious to me! I guess Grandma and Grandpa don't get too many trick or treaters in the country, eh?